Spirituality is not a religion, it is knowledge of awareness of Oneness. Spirituality is the bridge and the various religions are the pillars holding up this bridge. The bridge of Spirituality is eternally anchored and does not require the pillars of religion in order to exist. However, the pillars of religion require Spirituality to exist so that they may exist. What is Spirituality? It is the awareness, the consciousness that there is One Supreme Being, One Light, Oneness – which some people call God. The bible, used by over 2 billion people, has over 70 names used to describe this Oneness, this Source of Creation. It is the connectivity of and to that Oneness. It is the knowledge of Awareness when the person in the physical feels that connectivity to being part of Oneness – part of God. Your Soul comes from Oneness, from God. When your Soul feels this connectivity to its Oneness, you experience Love, and when more fully developed, Unconditional Love. This Love, this feeling of Love, enables you to experience Who You Really Are – at Soul level – part of Oneness, part of God. When you feel this Love as Unconditional Love, then you know God’s Love. Then you know God is Love. Then you know Love is all there is. Then you know God is all there is. Then you know We/we are all part of Oneness, part of God. Religion is not Spirituality. Religion is exclusive, Spirituality is inclusive. Religion is based on a specific set of beliefs, rituals and practices, usually within an organized group or structure. Spirituality has one knowledge, that of Awareness/Consciousness of Oneness. It has no set of beliefs, no rituals and no defined practices and exists without any organized group or structure. If Spirituality had to have a belief, it would be “God is Love”. If it needed a religion to make it more acceptable to earth’s 7 billion people, it could be called “The Religion of Love”. 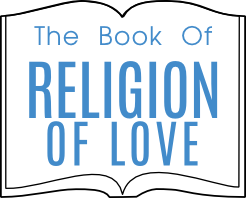 We start the Book of The Religion of Love with a greater understanding of what Love is. More chapters will be added by Us, via the Channel, at the appropriate time. We wish you Namaste – May the God within us greet the God within you and so recognize and remember Our/Your Oneness together. 1. WHERE DOES LOVE COME FROM?